I had to go back and look through old posts to see if I had already used this title, since I thought about using it last year when I set the goal of reading War and Peace by Pentecost. The Pevear/Volokhonsky translation had finally come out in softcover and it arrived on my doorstep sometime in April. At Easter I calculated if I read 25-30 pages a day I could finish it in 50 days. I’m a quick enough reader that 30 pages (even of Russian literature) wouldn’t be overwhelming, and I thought it would be a good practice – taking an hour or so in the evening to read. Besides, as Mark Twain said “A classic is something everyone wants to have read and no one wants to read”. There’s a part of me that just wanted to get through it. But a funny thing happened during the second week of Easter (about 150 pages in). The man I had been dating/talking to/seeing/whatevering for a few months became more than a “whatever” and my evenings changed. Now I was talking to him on the phone for an hour rather than reading. I was driving three hours to visit him (this was when I contemplated book-on-tape) or enjoying his company when he was visiting Boston. 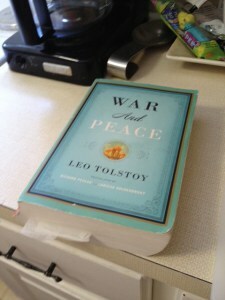 Pentecost came and went, and Tolstoy ceased to be one of my concerns. When I wasn’t building a relationship, I was singing that summer. I was training for a triathlon and a half-marathon (because isn’t that what you do during the summer?) I was sitting on the beach on rare occasions – and I have had enough experiences being “that girl reading Russian literature on the beach”. Pass me that issue of Glamour. September rolled around. The book was still next to the couch. I read a few pages here and there. I went back to work and got back on a routine, so I was optimistic about my reading. I got an iPad from my employer (this was when I wished I had gotten this as an e-book). I was still traveling on the weekends. I read a few more pages. Then I started throwing up. Nothing personal, Leo. Come to find out I have a chronic autoimmune disorder, which as it turns out never happened to any of your heroines, though they had problems of their own. So I was sick a lot, and when my stomach was cramping and I was trying to hold down green tea and a cheese stick, all I really wanted to pass the time were some West Wing DVDs. Not surprisingly for an anxious Italian like myself, stress was my trigger! So I started making good use of my yoga mat. I was assured that twisting my intestines all around is perfectly safe. There goes another three hours a week that I could be reading. On the bright side, I rock crow pose. Oh boy, with all the throwing up and backbends I almost forgot I was supposed to be finishing a degree! So I read a tome on the history of Penance on the train to visit my honey, only to find my summary so highly admired that the professor decided to change our reading list so that I could read 400 pages of Rahner instead of the other books he had assigned. What joy! What rapture! To paraphrase Twain, Rahner is someone everyone wants to have read and no one wants to read. Then I had to write my synthesis project, also on Reconcilation. All the while, War and Peace mocked me from the floor next to the couch (you can tell I don’t pick up very often). Somedays, I would wake up, trip over Tolstoy and remember “I have an audition tomorrow! I need to practice!” or “crap! I haven’t seen my family and friends in over a month!”. So I’d set about making that right. Another Easter has come and gone, and I still haven’t finish the silly thing. 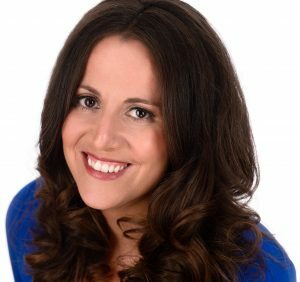 In my crazy mind, I didn’t accomplish anything in the last few years – as if finishing a degree, holding down a job while being diagnosed with Crohn’s disease, stretching out my hamstrings, and falling in love aren’t accomplishments. Just surviving this year is an accomplishment. But I still have my trusty paperback with me, and I am setting the goal again to be done with it by Pentecost. Unfortunately I recently read a spoiler, in Opera News of all places. In fact today, when I was planning to spend my vacation time researching the Order of Mass in French, I might sit outside and enjoy the sun and read. Or maybe I won’t get to it today, or by Pentecost, or ever. Either way I’ll survive.